In Acts 24 Paul is transferred to the governor Felix for protection from the Jews. Although he is twice called “most excellent Felix” (23:26, 24:2), Felix is well known as a particularly bad governor of Judea. As Keener observes, although Luke does not paint a flattering picture of Felix, he is more flattering toward the governor than any other ancient writer (Acts, 3:3328). His full name was likely Marcus Antonius Felix. He was appointed as governor of Judea about A.D. 52 by the emperor Claudius. Felix and his brother Pallas were freed slaves of Claudius’ mother Antonia. Both were favorites of Claudius. a favorite in the court, this lead Felix to believe that he could do as he pleased. That Claudius would appoint freedman to posts such as this was considered unusual by Roman standards (Seutonius, Claud. 28). Since he was a freed slave, Tacitus thought his “servile nature” explained his inability to rule well (Hist. 5.9). 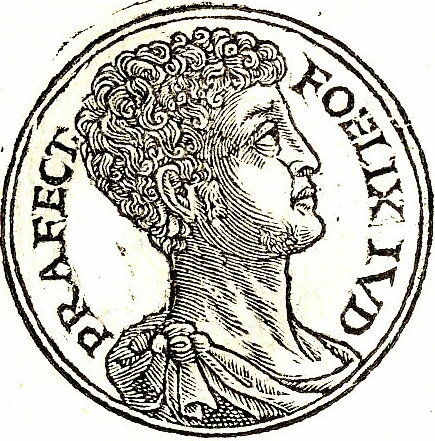 Felix had a reputation for cruelty, he suppressed many of the bandits that had risen in Judea, but he did so by extreme violence. He made a deal with one of the leaders, promising safe passage, then captured him. When the Egyptian rallied people in the desert, Felix attack, killing four hundred followers. Later he paid the sicarri, the knife-wielding assassins, to take kill the high priest Jonathan who had complained to Rome about Felix, hoping for a better governor (Antiq. 20.163, JW 2.256). Antiquities 20.164–165 Certain of those robbers went up to the city, as if they were going to worship God, while they had daggers under their garments; and, by thus mingling themselves among the multitude, they slew Jonathan; (165) and as this murder was never avenged, the robbers went up with the greatest security at the festivals after this time; and having weapons concealed in like manner as before, and mingling themselves among the multitude, they slew certain of their own enemies, and were subservient to other men for money; and slew others not only in remote parts of the city, but in the temple itself also; for they had the boldness to murder men there, without thinking of the impiety of which they were guilty. Like the other Roman governors of Judea, he was anti-Semitic, although this might be better to describe Felix as “Roman-centric.” Nevertheless, this assassination is one of the factors which led to the Jewish Revolt. Felix was married to Drusilla, the daughter of Herod Agrippa I (Acts 24:24). Only six years old when her father died in 44, Julia Drusilla was originally betrothed to Epiphanes, the son of the king of Commagene (between Cappadocia and Syria), on the condition he convert to Judaism (including circumcision). When he was unwilling to do so, she was married to Azizus, the Syrian king of Emesa (about A.D. 53) at the age of 14. She was reputed to be very beautiful (Antiq. 20.142) as was her sister Bernice (Agrippa II’s wife), who was jealous of her younger sister. Felix persuaded her to leave her husband and marry him, although he refused to convert. She and Felix had a son, Agrippa, who died in A.D. 79 in the eruption of Mt. Vesuvius (Antiq. 20.144). Felix persuaded Drusilla, then about 20, to leave her husband and marry him. There is no indication that he was forced to be circumcised, perhaps this was her father’s will not her own. Felix also married the granddaughter of Anthony and Cleopatra (Seutonius, Claud. 28). Felix and Drusilla had a son, Agrippa, who died in 79 in the eruption of Mt. Vesuvius (Antiq. 20.144. ), and it is at least possible that Drusilla was with her son at the time. Felix’ mismanagement of the territory of Judea was one of the factors leading to the revolution in A.D. 66. Acts portrays him as treating Paul fairly and finds nothing which merits punishment. However, for political reasons he is unwilling to challenge the Jewish authorities by simply releasing him. Like politicians of all ages, Felix simply did nothing and left the matter to his successor, Festus. Bibliography: D. C. Braund, “Felix” ABD 2:783; Schürer HJP² 1:460-466. As I read though chapter 24 and the post, I first thought that it was odd that Felix did not do more with Paul. He seems a little bit of a slim-ball, having a “reputation for cruelty, ”persuaded Drusilla to leave her husband for him and “hoped that money would be given him by Paul” (P.Long, Paul and Felix, Acts 24:26). However despite his persona, Felix does seem to teat Paul respectfully, “he should be kept in custody but have some liberty, and that none of his friends should be prevented from attending to his needs” (Acts 24:23). It was the last sentence of P.Longs post that made it all makes sense to me, “Like politicians of all ages.” That is exactly why he acted the way he did. We know that he tactful because; he had “a rather accurate knowledge of the way” (Acts 24:22). He knew that if he had dealt with Paul harshly he would have many others to answer to. Right away, instead of giving a judgment, he says that he will deal with the issue when “Lysias the tribune comes down” to keep peace and appease all parties for the time being. This reminds me a lot of how Gamaliel acted in Acts 5, “take care what you are about to do with these men…so in present case I tell you, keep away from these men and let them alone, for if this plan or this undertaking is of man, it will fail” (Acts 5:35-39). This is not exactly what Felix did, but he was wise in the way of not acting quickly because he did not want rioting and trouble on his hands, shoving off the responsibility onto someone else. Hilary, great job on your discussion post this week. I thought you and P Longs thoughts on Felix acting the way he did due to politics was very insightful. I also, liked how you tied it with another similar story/situation. After, reading I too thought of a time a similar situation occurred. It reminded me of when Pilate ‘washed his hands’ of crucifying Jesus. Matthew 27:24 “When Pilate saw that he was getting nowhere, but that instead, an uproar was starting, he took water and washed his hands in front of the crowd. “I am innocent of this man’s blood,” he said. “It is your responsibility!” Felix, like Pilate, was trying to keep the peace because they saw it as the best overall option for the people. It is interesting that such a similar situation happened here. Felix and Pilate both saw nothing wrong yet both did not release Jesus or Paul because they did not want upset the people. Do you think this is simply a coincidence, or something more? It’s hard to say. Although I believe all scripture is God-breathed (2 Timothy 3:16), can one say the two go hand in hand? Maybe P Long could help us out with that question. It always intrigues me when we put the scriptures in the political context of the day. The life and rule of Felix provides some real insight into the oppression that the Christian community was enduring. In Felix’s case, his focus on Roman superiority has made him cruel and indifferent towards other ethnic groups. So in persecuting the Christians for saying that they have a king who was going to come back and set up his kingdom, he felt justified in persecuting them. He had to hate the thought of the kingdom of God, because it would dethrone him and put Jews (an inferior race in his mind) above him. We can see this same mentality in Herod in the time of Jesus, when he killed all of those babies to prevent this Jewish king who was born (Jesus in Matthew 2:16) from ruling. Paul is very fortunate then, that Felix does not treat Paul unfairly, and that he can not even find fault. Felix’s ethnocentrism alone could have given reason to imprison or treat Paul very poorly, but God is faithful to Paul and delivers him from a situation that could have gone very poorly for Paul. A freed slave as a ruler does seem quite peculiar. I view this as a gamble, because what if the freed slave held contempt for the nation? If the freed slave did he could try to mess up things on purpose. The fact that Felix chooses not to do anything to Paul could be that he was being a politician and was worried of riot or it could have been that the Lord had placed it on his heart. Felix resembles Pontius Pilate in many ways. Both men had the Jews bring them men who were defying their religious ways. Both men had the Jews call for the offenders to be killed. However, Felix chose to do nothing about the accusations against Paul, whereas Pilate chose to listen to the Jews and have Jesus killed. Felix decided to just let it go to Festus, as P. Long said. For a man who is known for brutality and cruelty, this is certainly a sign of God’s faithfulness, as Adam pointed out. God’s hand was upon Paul, protecting him from Felix’s wrath. It is very unlikely, logically, that a man who is well-known for his malice would treat a Jew fairly. God defies logic. This protection that Paul has defies logic. You cannot explain it. God moved on Felix to treat Paul fairly. Looking at this account with historical accuracy in mind, you could quesion whether or not there is truth in this story. If Felix was as terrible as he is reemmbered to be, then why did he not punish Paul? Sure the argument that he simply left the issue to his successor can be made, but how well can it be made? As you say in the post, Roman citizenship means a lot in this world, so wouldn’t Felix want to make an effort to come to a conclusion instead of shrugging Paul’s case off like the case of a random person? I do not doubt the accuracy of the Bible, just bringing up a few questions. Another reason could be that Felix only saw Paul as a disturbance. For Roman provincial governors, maintaining order was essential. Most likely, Felix viewed Paul, although not guilty, as causing disturbances because of the disagreements between him and the Jews. Rather than deal with more problems, Felix might have just thought it simpler to eliminate the perceived catalyst, which was Paul. Either way, Felix did not seem to interested in justice, but more interested in protecting his position as governor. Just because it is a hard story to believe doesn’t mean it is false or not accurate. If that were the case we would have to question everything in the Bible. I know Chris is not questioning the Bible, I am answering his questions however. Just because we cannot explain it doesn’t mean God cannot do it. There are many things that I cannot comprehend, take God’s love for me, it is amazing and I really wonder why He does love me but He does and I am cool with it. This part of the Bible has so much application past just what Paul was facing. “Felix is well known from history as a particular bad governor of Judea.” (Long). This can be used for Christians who think they are getting gthe raw end of the deal or have a boss that just doesn’t understand and is in it only for the money. God always has a plan and places all positions of authority in place for his purpose. Authority is always given by God so Paul, and that Christian with the bad coach, can look at their situation and think “Man, this is rough I got a bad person calling the shots and making decisions or me, where is the way out?” Or they can realize that God has the true authority and is using everything for his good and trust him that the outcome will reflect God’s glory and show who is really in power over everything. “No one but a citizen of Rome really counted for much in the ancient world!” I also find it interesting that this part of the blog was in there because Paul actually was a roman citizen and at this point, everyone who held him captive knew it. Even Paul’s citizenship status could not get him out of facing a cruel authority figure who had a reputation for looking out only for himself. However, the last part of the blog reveals God as the true authority figure in Paul’s life and in all Christian’s lives. “For all of this he treats Paul fairly and finds nothing which merits punishment — although he is unwilling to challenge the Jewish authorities by simply releasing him” Felix, horrible reputation and all, gave Paul a fair shake at his trial and his trial was based only on the facts of the case not many external factors. I love what Dan said in his post that best summarizes what is going on in the blog and in all of the Bible. He said “Just because we cannot explain it doesn’t mean God cannot do it”. God is in control, sometimes he uses not righteous leaders to remind everyone that he has the final say. As it has already been mentioned in previous posts, Felix does nothing to defend Paul. There are some questions resulting from Felix’s actions. I wonder why Felix allowed Paul to make his defense. It seems that Felix had already made the decision on Pauls case by silently dismissing it. Felix decree’s Pauls punishment but the fact that he goes and speaks with Paul on multiple occasions is rather interesting. (24:23-26) It is almost as if the Jews control what is going on in the city (including governmental matters. Would Felix have defended Paul if the Jews were less adament in their actions to convict Paul? Also Felix has some much power (being that he is the governor) yet he leaves Paul in prison to appease the Jews. (24:27b) If I was the governor of a particular state (michigan for example) I would take my people’s thoughts into consideration but I would make the final decision on the matter whether the people agreed with it or not. And I could do that only by my status as governor. However, I agree with Chris in saying that this event (with all of its questions) does not lessen the authority of Scripture in any way. “If I was the governor of a particular state (michigan for example) I would take my people’s thoughts into consideration but I would make the final decision on the matter whether the people agree”, this is a great point, if Felix was the governor of Michigan. Romans, on the other hand, thought of themselves as so superior to the conquered people that they rarely took into consideration local thoughts and opinions. In fact, Jews probably more deference from the Romans than most captured people. Who was Felix. I would agree that comparing him to a modern politician that simply is passive in their duties. It is interesting that Felix is title, “most excellent”. He is known to be a pin head of a governor. Judging by what we know about him, the man was cruel, and cunning, and as the text implies, he may be susceptible to flattery, and was feared by the people. This governor was nothing like Gallio, who displayed integrity. However, it seems that Felix does not deal harshly with Paul, rather just pushes the case to the successor. In the mean time, Felix seeks to receive a bribe from Paul. I think we can say that God is clearly at work in Paul’s circumstances. When you follow the environment that enters, we see God providing protection and provision in ever way. God uses just people like Gallio, and corrupt people like Felix to further the gospel. It’s always interesting to learn about characters like Felix. With being a governor and involved in the political scene, It would have been hard not to have believed the “sliminess” in his romantic life. It is important to note as Dr. Long mentioned, that “Romans, on the other hand, thought of themselves as so superior to the conquered people that they rarely took into consideration local thoughts and opinions”. This is important as to understand how he viewed his role as a governing official. The idea of having superior authority would have more than likely lead Felix to have persuaded Drusilla to leave her husband who have converted to Judaism while Felix didn’t see the need to become circumcised. A lot of the previous posts above me, compare Felix with Pilate. This was because both me had the opportunity stand up for those being accused of wrong doing and decided to put the decision of what to do in the hands of others. I would agree with those statements. Felix was a interesting character to read about because of the role that he played as a leader. What interested me in Felix was that he did not punish Paul yet he was know to be known for condemning people for their actions. Because Felix allows Paul to plead his case it makes be wonder what Felix was thinking at the time. Had Felix already came to a conclusion on what he was going to do with Paul or was he going to hear him out? Because Felix had multiple conversations with Paul it makes me believe that Felix was influenced by the Jews even though he had the power as Governor. While Felix is not the most popular of the Roman Governors I do feel like Judea gets a string of bad Governors for most of the time that Rome is ruling over Israel. So, the reason I think Luke portrays him in a bot more positive of a light than the rest of history is because Luke is trying to make a point that it was another bad Roman ruler that was ruling of Israel at the time. It just so happened that Paul was brought to him and Felix after hearing the case din’t really want to do anything with it, in either case we would look bad, either with the Jews where he lived at the time, or with Rome where he came from. So instead of making a decision he just left it be. In Acts 24, we see Felix a governor, he was a well-known man. Luke himself tells of Felix, but in a particularly nicer way than other writers. He was empowered by the emperor Claudius, who believed in him because of his background. Felix was a freed slave and because of this Claudius believed he had a connection with the people and leadership skills. This in my opinion looking on the outside, was not a great idea and would be a gamble. Most politicians have a little bit of education to prove for themselves. So, Claudius, most have seen something special in him. This situation, however, was not the case as he held a reputation for cruelty and mistreatment. On several occasions, Felix proved this reputation. Felix has a lot of family drama. His wife had been pursuing other men and navigated through relationships, before meeting Felix, and eventually leaving her husband to be with him. They even had a son, Agrippa. Besides the family history and difficulties there, Felix also leads Judea into a revolution. Paul had a decent relationship with Felix and did not run into any major issues. This could have been for multiple reasons and just the acknowledgment of who Paul was and his supporters. I appreciated Professor Longs last sentence, “Like Politicians of all ages, Felix simply did nothing and left the matter to his successor, Festus.” Most politics do not get resolved in the time they rule, they go in make some mistakes and another person has to clean it up after.